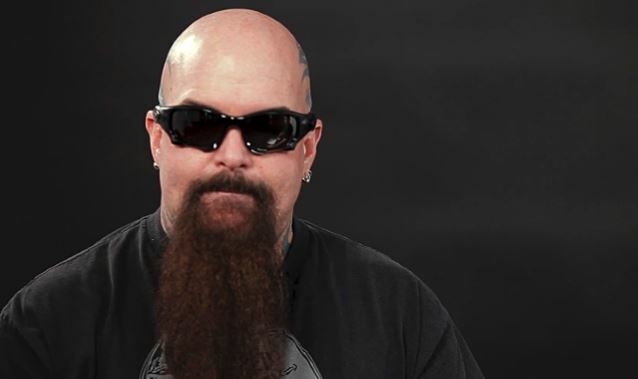 MetalRockNews: Slayer's Kerry King about playing 'big four' shows: "I think that was important"
Slayer's Kerry King about playing 'big four' shows: "I think that was important"
Slayer guitarist Kerry King was recently interviewed by Review Journal, you can read some excerpts below. About to recount one of the most memorable nights he had being in Slayer, he said: "Something that was really cool for me and I didn't think it was going to be as cool as it was, was when we did the 'Big Four' shows with Metallica, Megadeth and Anthrax. I think that was important. I think it mattered. When I went in, I thought it was going to be cool for the fans, but in the end, it was cool for me, too." He added: "The funniest thing in the history of Kerry King and Slayer is us and Metallica, we don’t really run in the same circles. As similar we are, you know, we've never been on tour with those guys. To actually play with them on the 'Big Four' was really cool for me. I'd go back behind where Lars Ulrich goes when he gets done with a song, we called that Larsland, we'd go watch the show from there. It was really cool. It was just cool hanging. Kirk Hammett would come and hang out, and we'd go do stuff with Lars. It was fun."